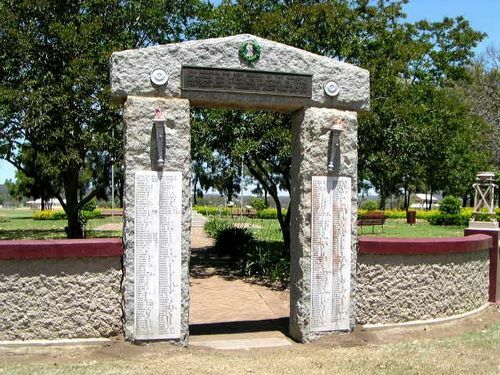 The Memorial Park Gates are flanked by two marble panels which contain the roll of honour for men and women of the Laidley District who served in World War One. The gates and war memorial were unveiled by the Governor of Queensland, Sir Matthew Nathan on the 15th February 1923. The Fallen Soldiers Memorial and Soldiers Honour Roll are now being erected at Laidley. The memorial is a an obelisk of grey granite which is 22 feet high. Three marble tablets contain the names of the men from the Laidley Shire who paid the supreme sacrifice and on the fourth tablet will be a suitable inscription. The soldiers honour roll is a gate archway constructed of grey granite with a bronze lintel with the inscription. On two marble tablets are engraved the names of all the men who enlisted from the Laidley Shire or were residents in the Shire when they enlisted for service.